Hyderabad: The phase one of L&T Metro Rail Hyderabad Ltd will be commercially operational by the first quarter of 2016. The Telangana Government is exploring the possibility of expanding the metro rail network mandate from 72 km with the addition of another 85 km. 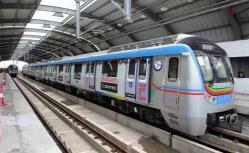 “The L&T and Hyderabad Metro Rail Limited have done a great job thus far in implementing the project as planned. Most of the hurdles for the project have been sorted out and we expect some of the remaining issues relating to the project in the Old City of Hyderabad would also be thrashed out soon paving way for completion of the project as per schedule in 2017,” KT Rama Rao, Telangana Minister for IT and Panchayat Raj, said. Interacting with reporters after a test run of the metro rail project over a stretch of 8 km between Mettuguda and Nagole, the Minister said that the State Chief Minister, K Chandrasekhar Rao, is keen that the project is expanded from the current under construction 72 km stretch to 200 km in a phased manner. “However, in the next phase, we have identified five extensions of total stretch of 85 km,” he said. Referring to the proposals made by the Telangana Government after it assumed office last year about change in alignment, Rao said the government had proposed certain changes keeping in mind the heritage structures and some requests made in a couple of corridors. “All of these have been sorted out, we expect the works to be expedited and completed as per schedule,” he said. The alignment issues got resolved as the metro authorities have agreed to develop the project even in a smaller 65 feet road width stretch. By doing so, the bottlenecks have been sorted out and the concerns expressed by hawkers will also be sorted out, he said. ‘We will provide special place and make it a hawkers’ paradise for those affected by the metro construction. They will get the best compensation too,” Rao added. The test run conducted for the media in the presence of four Telangana Ministers and the officials of L&T Metro and Hyderabad Metro, over a stretch of 8 km, was very enjoyable, as per feedback from some of those who took the ride. Most on board took to selfies to share with their friends and families. The 8-km stretch was covered in less than 8 minutes. The rail was piloted by Srilakshmi, a young lady from Peddapalli town.